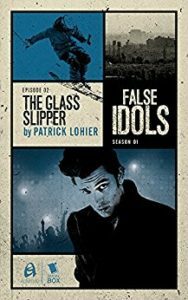 Coming from a TV writing background myself, I am so excited to see the Writers’ Room technique used to create a book — in this case, False Idols, published by Serial Box. The idea of serializing stories has been used by such masters as Dickens and Conan Doyle. But this one has a twist: the installments, or “episodes,” are written by three different writers: Lisa Klink, Patrick Lohier, and Diana Renn. 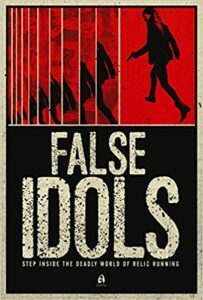 False Idols is a thriller set in Cairo, in the world of high-end art theft. Thieves stealing priceless artifacts to sell on the black market and using the money to fund terrorism — that’s the network undercover FBI agent Layla el-Deeb needs to ferret out and bring to justice. It’s a thrill ride with depth, as Layla struggles to keep her own sense of self while going deep undercover. It’s also not their first rodeo. Lisa Klink was kind enough to be my very first interview on Destination Mystery, when her wonderful, high-octane caper, All In, written with Joel Goldman, came out. In addition to writing for one of my favorite TV shows (Star Trek: Deep Space Nine, so much love for that show! ), she has written novels in The Dead Man series, and so much more (BATMAN!!). Follow her, @LKKlink, on Twitter. Patrick has written short stories, criticism, and a novel, Radiant Night, which will be published later this year by Adaptive. You can find his website here, and he hangs out on Twitter as @PatrickLohier. And let’s not forget Diana! She has several novels for young adults, with globe-trotting teens and international intrigue. Her most recent, Blue Voyage, gets praise and nominations from around the world, including kudos from one of my favorite YA thriller writers, Lamar Giles. Here’s Diana’s website, here is her author Facebook page, and, since we’re doling out Twitter handles, you can find her as @dianarenn. All three writers share credit for bringing into the piece the lovely concept of Kintsukuroi, or fixing broken things with gold. They also give credit where it’s due to consultant and former FBI agent Robert Wittman, and give a shout-out to his book, Priceless: How I went Undercover to Rescue the World’s Stolen Treasures, which I, too, have read and highly recommend. 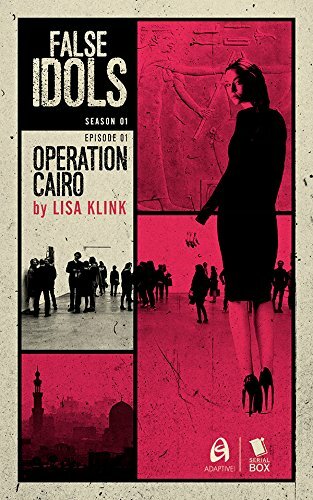 Finally, did I mention that False Idols Episode 01: Operation Cairo is free on Kindle? Well, I’ve taken care of that now. Laura Brennan: I am so excited to have not one, not two, but three killer guests on my show today. The wonderfully talented Lisa Klink has teamed up with Patrick Lohier and Diana Renn to create a new kind of book — one that comes out in episodes. 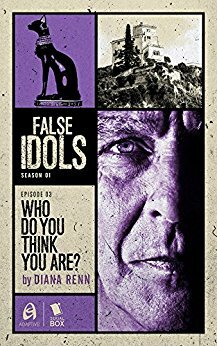 False Idols launched with Episode 1 on January 16th. Lisa, Patrick, and Diana, thank you for joining me. Lisa Klink: Happy to be here. LB: So let me start by asking each of you just to let me know a little bit about yourselves and your writing. Lisa, I’m going to start with you because I know you started out television. LK: Yes, I did. I started out in the world of Star Trek with Deep Space Nine and Voyager. And had a great time while I was on Voyager for three seasons, and then I went on to other shows like Hercules and Roswell and Martial Law. And was in TV for a while and then switched over to, I guess, prose or novels. Lee Goldberg and William Rabkin, who were showrunners of mine for Martial Law and for Missing, had a series of books called The Dead Man, that they had individual writers writing basically short novels. So I worked on three of those and then I cowrote a novel with Joel Goldman called All In. And we just finished the sequel, All Gone. So All In is available on Amazon now and All Gone should be coming soon. LB: Oh, I’m so excited. I love that. And I had the pleasure of interviewing you when All In came out. So that was fun. LB: Patrick, you have made your mark in short stories and essays. Patrick Lohier: Yes, I actually don’t have as much publishing experience as Lisa and Diana, but I have written some criticism and some short fiction, and I actually have a novel coming out through Adaptive Studios, which is one of Serial Box’s partners. They’re based in LA. And that novel, titled Radiant Night, will come out sometime in the spring. LB: That’s fantastic. And, Diana, you have three other books. Now all of them have been for young adults? Diana Renn: That’s right. I think there’s been some crossover readership because there are a lot of adults in the worlds that I’m describing, but they are marketed for young adults. They’re all international mysteries featuring globetrotting teens and international intrigue. The last one, Blue Voyage, my most recent novel, took place in a similar world to False Idols in that it deals with relic runners and the black market for illicit antiquities. So it was kind of fun to switch gears and think of a slightly more sophisticated, mature readership for this current project. 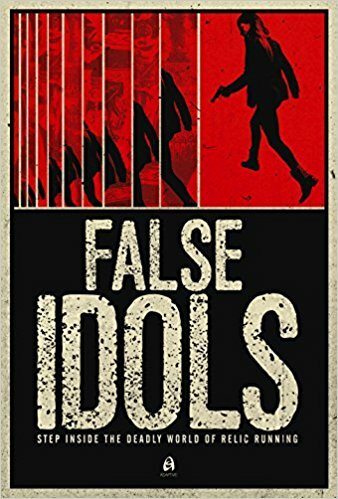 LB: It’s such an interesting story about how this book is being written, but before we do that, I want people who don’t know about False Idols — what do they need to know about the story? LK: Well, it set in the world of illegal antiquities, which especially in the Middle East is huge problem where historic sites are being rated and looted an ancient treasures are basically being sold on the black market. A lot of that money actually goes to fund terrorist groups. So that’s the backdrop, and our lead character, Layla, is an FBI agent who goes undercover in Cairo as an art collector in the very high-end world of antiquities collecting and has to trace the path of how the antiquities get to the rich collectors in the US and how the money gets to the terrorists. LB: So, I love that. Partially, Lisa, it has the same sort of high-end adventure feel as All In does. LK: Yes! I hope so. LB: And, Diana, it plays right into the worlds that you’ve written about. DR: Yes, absolutely. It was familiar territory in a lot of ways even though this takes place in Cairo, where I’ve never been. But having done a lot of research and immersing myself in the world of this type of spurious art dealership, it felt kind of familiar to me and I learned a lot more, as well, this time around. LB: So, Patrick, how did you get involved in this? How did the three of you find each other? PL: So, I think there is a link to my own novel that’s coming out later this year. There’s an art theft involved in that plot as well. What happened, my involvement is a little bit circuitous: my agent’s former assistant, who is now an executive at Adaptive and who had read the manuscript of my novel, I think when this came up, when the idea for False Idols came up, I think it must have jogged his memory about that plot point in my manuscript. So he reached out to me and he described the Serial Box development model and asked me if I’d be interested in working on a project that involved this world of art theft. It sounded completely intriguing to me. So that was in mid-2016, and he asked me to sort of stand by for a couple of months as the team was identified, as the other writers were identified. And then later that year, we were all invited to participate in a writers room out in LA, in Culver City, at the Adaptive Studios offices. Again, Adaptive is partner with Serial Box on this project. So that’s where I met Lisa and Diana and the teams that both Serial Box and Adaptive. We just had this incredibly intense few days of taking what we call the story bible that Lisa had worked on with, I think, a couple of people at Serial Box, if I’m not mistaken, and at Adaptive. So we took those few pages and we spent a few days just kind of holed up with notebooks, post-its, whiteboards, blackboards, just basically fleshing out all the episodes of this thriller. It was extremely exciting, it was a lot of fun. LK: It was a lot of fun. I’ve got to say, it felt a lot like a TV writers room, which is something that I definitely miss from television. But, yes, to sit in a room with a bunch of smart people and talk story is just my idea of a good time. LB: That’s so neat! You’re actually building a book series or a series of novellas, I would, because they’re shorter than full-length books, each episode. DR: I actually think of it as a book that is told episodically. I think parallels to Dickens in some ways are apt; those were very long books with chapters with many things happening, he had large casts of characters, and I think our book has some of those hallmarks as well. I think we were writing episodes as long chapters, longer than you might find in a regular, traditionally published book because we’re looking for a certain length of time, something that someone could read or listen to on their commute, for example. Maybe 45 minutes of reading or listening. However, the character arcs and the development of the plot and subplots, and the way that we wanted to leave our heroine by the end, the types of questions we were asking are very much the types of questions I asked myself when I work on novels. So, initially to me, the process was unfamiliar because it was so much based on the TV writing model and it was new and exciting and everything looked kind of clear in a way that I wasn’t used to. Oh, this is episode one, this is episode two, three, and it’s all mapped out. And then as you get into it, you realize like with a book, you hit problems or plotholes and you have to work through those. But the fun part for me was getting out of plot holes and problems with the support of these excellent writers. Not feeling so alone in the process. LB: So this was a way for you to collaborate, but it’s collaboration on a really deep level. Everyone had a say in how the story developed, is that correct? PL: It’s a very intense process in terms of just the tools that we used and the almost daily contact. We were in Dropbox, Google Docs, we’re using Slack, email, videoconference, teleconference. So we spent a lot of 2017 together. DR: I think at one point we were texting, even — I remember I was in Europe on a family vacation and I was in an amusement park with my kid, and texting Patrick stuff, or emailing at least, on my phone about how to blow up an embassy. Which I then realized wasn’t wise because I want to come back to my country. [Laughter.] We just became almost all on the same wavelength and communicating as quickly and expediently as possible. LB: I want to know how you developed your main character. Layla is a very different kind of person, she really isn’t someone who has — she’s not James Bond. LK: Right. I think that was obviously the first main issue. I worked with Serial Box, they’re the ones who had the basic premise for False Idols, including our main character, Layla el-Deeb, who was actually born in Egypt and then came to America and joined the FBI. Figuring out what her motivation was for all of that, that she wanted to leave Egypt, that she wanted to be Western and she wanted to be an FBI agent. And then, what does that mean? What department would she work in? How would she find her way into this investigation? What would drive her? Is she interested in the art been destroyed? Is she interested in the terrorists? Is she interested in the world of antiquities running? I think pinning her down was pretty much job one. PL: I agree. I think we also wanted to give her story, like her human story, a lot of depth. And I think that we accomplished that in terms of some of the personal challenges in her past and her learning curve. This kind of profound learning curve from a novice FBI agent into someone who’s doing some pretty extraordinary and intense things while undercover. LB: The thing about undercover, I’m glad you mentioned that, because that is a big part of it. She’s a woman who is figuring out who she is and what she wants, but at the same time she’s going undercover and she needs to hold onto who she is and what she wants while she’s being somebody else. LK: That’s certainly what interested me about it, is that she has, there’s a lot of layers to her identity. Because she started off as this dirt poor kid from Cairo, had to reinvent herself to get to the United States and get an education and become an FBI agent, and has already developed a persona for that and has rejected her childhood self. And then in the context of going undercover as a super-wealthy heiress in Cairo, she’s now dealing with people who’ve been privileged all of their lives, and pretending that she’s one of them, too. So it’s another layer of, you know, she grew up with literally nothing and now she’s pretending that she grew up with everything. LB: At this point, only the first one has dropped, so I’ve only been able to read the first episode, which I loved. But towards the end of the first episode, you guys talk about this idea of two ways of fixing something: that you can fix something is broken in such way that no one can tell it ever broke. Or you can fix it in a way that draws attention to the flaws, but there’s extra beauty in that. It makes it even more special. And forgive me if I think that might also be a metaphor for your heroine. LB: Was that deliberate? Who brought that piece, because it’s just lovely. Who brought that piece in? LK: I think that was a collaboration because we had the scene that takes place at this party and we knew that we wanted James to take Layla up and show her some of the art. And I have always been really interested in the Japanese art of — I’m totally going to say this wrong — Kintsukuroi. DR: I’m glad you said it! LK: Basically, yes, piecing together broken things with gold so you can see where it’s been broken. I’ve always found that fascinating. I think I suggested that as maybe something they could explore, but then Diana actually wrote that scene where he takes up and shows her. I think that she really mined the metaphor of it in a really lovely way. DR: Thank you. It was really fun collaborating on that and thinking of how that theme might resonate in other episodes and other scenes. Although we don’t come back and hit it over the head and use that term explicitly, I think that that’s a seed of part of Layla’s character growth. What’s fun for me about writing about antiquities is, so many metaphoric possibilities. We’re dealing with issues of authenticity and identity and provenance and history of an object, and Layla is very much concerned with her own provenance. Does she look good on paper? How is she presenting herself? Where are the cracks in her identity and what might leak through? Who is perceptive enough to really see her for who she is — and what are the consequences of that, good and bad? LB: So what kind of research did you have to do for False Idols? LK: I certainly did a lot of online research and got a lot of library books, but we also had a terrific consultant, Bob Wittman, who is an FBI agent who actually founded the Art Crime division of the FBI. So he was obviously The Man to tell us how everything worked. He looked at our outlines and our drafts and gave us feedback about, is that how the FBI really does things? He gave us suggestions about what else we might think about trying. He was terrific. And he has a really good story sense. DR: And his book, Priceless: How I Went Undercover to Rescue the World’s Stolen Treasures, it is a riveting, page turning memoir. I highly recommend it. I read this book 3 times at various points. I read it before we all met and started writing, it was part of our homework. I read it at two different points in that year of writing because I formulated different questions as I went along in this book had so many answers. It helped me solve problems as they came up. It’s a great read. LB: How many episodes are there? PL: There are 11 episodes. LB: Are they coming out once a week or once every other week? LB: Once a week. So this is fabulous because you just have time to read one and then you don’t have to wait a year for the next one to come out, it’s going to come out just about the time you’re finished with the first. LK: I think that’s the idea, yes. LB: As you mentioned, it harkens back to the days when things were serialized, Sherlock Holmes and Dickens of course. Do you guys have plans do other things along these lines? DR: I think we have a hope of the season two. Serial Box has a number of really great books or series, I should say, that have gone into season two and even season three, just like favorite TV shows can have an extended life. So we don’t know for sure what Layla’s fate is, but I think we tried to end with her in an intriguing place where she could go in some interesting directions. LB: And for each of you individually, you’ve each got something coming out soon. Patrick, what is the name of your book that’s coming out in the spring? PL: My book is titled Radiant Night. It’s set 14 years ago, it’s set in about 2005. It’s about a young vet, a young former Marine who comes back from Iraq and he’s a bit messed up. He’s struggling to find work and to make a living and to support his family, and he gets a very strange job offer to retrieve an artifact, an heirloom, that had been stolen from a family decades before. He’s basically trying to be a detective without any of the skills of a detective, and just really trying to make a quick buck. But he gets in way over his head. LB: No, I love that. Oh, he’s in trouble, excellent! That’s so great. And, Lisa, I know your sequel to All In is coming out soon. LB: Diana, what are you working on next? DR: I’m just listening to Patrick describe what he’s been working on quietly this whole past year, and I’m in awe. I don’t know how you could write two mystery/thrillers at the same time. PL: They weren’t simultaneous! That one predated False Idols. It just took a while to get it, basically to find a publisher. DR: Your head was in two places, so good for you. I needed a project while I was working on False Idols that was complementary and that didn’t twist me into a pretzel plot-wise too much. So I went in a really different direction and I’m just finishing, I should be done this month, I’m finishing a draft of a mystery for much younger readers, for middle grade. It has not sold yet, so not really speaking about it. It’s sort of a project of my heart that I’ve really had fun working on; it’s kind of an eco-mystery/thriller for kids. LB: You can’t have enough middle grade mysteries as far as I’m concerned. LB: I want people to be able to find you online. Of course I will link to each of your websites and, Lisa, to your Amazon page in my show notes. But for people who don’t go to the show notes, what’s the best way for them to find you online? LK: Well, I’m on Facebook and Twitter is probably the two social media I use the most. So just look for Lisa Klink on both. PL: For me, I think the best way to reach me is, I have a website. PatrickLohier.com. And I’m also on Twitter as well. DR: Yes, I have a website: DianaRennBooks.com. And I am on Twitter, I’ve been a little quiet lately but I’m coming back so you can follow me on Twitter @DianaRenn. And I have a Facebook author page, again I’ve been a little quiet there but you should see a little bit more activity soon. LB: Fantastic! Thank you all so much for joining me today. DR: Thanks for having us.